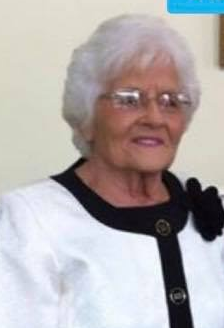 Obituary for Barbara (Brashear) Crouch | Powell Funeral Home, Inc.
Barbara Ietta Crouch, of 2865 Pine Grove Road, Olympia, KY passed away Saturday evening March 23, 2019 at her residence. Born in Perry County, KY on September 20, 1936 a daughter of the late Oakley and Gladys Parker Brashear. She was a retired employee of A.O. Smith Corporation in Mount Sterling, KY and was a member of the Mudlick Church Of God. Survivors include her husband Bryan Crouch, 1 daughter, Liz Norris and her husband Mark, 2 sons, Denver Crouch and his wife Linda and Doug Crouch and his wife Sandy, 2 sisters, Margaret Mann and Pearl Ferguson, 8 grandchildren, Heather Jent, Jani Highley, Kyle Crouch, Casey Beth Lyons, Brooke Allen, Jessica Lykes, Kaitlyn Norris and Jasper Crouch and 12 great-grandchildren. In addition to her parents, she was preceded in death by 7 brothers, Virdis Brashear, Harlan Brashear, Swanson Brashear, Fred Brashear, Adrian Brashear, Olan Brashear and Oakley Brashear, Jr.
Funeral services will be Tuesday March 26, 2019 at 1:00 PM at Mudlick Church Of God with Rev. Mark Caldwell officiating. Burial will follow in the Brashear Family Cemetery, Pine Grove Road, Olympia, KY. Visitation will be from 6:00 PM – 8:00 PM Monday March 25, 2019 at Mudlick Church Of God. Serving as pallbearers, Todd Lykes, Kyle Crouch, Jodie Jent, Mark Norris, Bobby Allen and Greg Highley. Honorary pallbearers, Bud Lyons, Danny Ray Crouch, Stewart Brashear, Kaden Lykes, Noah Jent, Jace Jent, Parker Crouch, Alex Crouch, Zane Allen and Jasper Crouch.